Representative Toby Barker is proposing that electronic signatures be used in the referendum and initiative process. 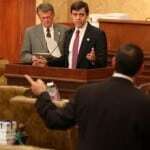 District 102 Representative Toby Barker told the Hattiesburg Patriot, "A concurrent resolution will be dropped some time today or tomorrow” proposing a number of updates to the Mississippi State constitution. All proposed legislation and resolutions are dropped into a box and then delivered to the appropriate chair. The proposed changes update the language within the constitution to reflect the current four districts instead of the previous five. Mississippi lost a representative back in 2000 when the census reflected a decrease in population. The most exciting item being proposed by Rep. Barker will be a bill for the inclusion of electronic signatures in the ballot initiative process. Mississippians presently must obtain over 100,000 physical signatures 20% from each of the old five districts to get a ballot initiative on the ballot. With the constitutional updates these signatures will change to 25% in the four districts. If a bill is passed to allow for secure electronic signatures this would be a power boom for the people of Mississippi. If you support electronic signatures in the initiative and referendum process please fill out the petition below. Below the petition is the concurrent resolution that Representative Barker is sponsoring. The bill to add electronic signatures to the process will be submitted separately. Please consider donating to the Hattiesburg Patriot and support our efforts. We have real cost in bandwidth, hosting, design work, etc. [paypal-donation] If you can't donate, please consider sharing this article on Facebook. A positive step into the twenty first century.